Veterinarians across the U.S. might see more cats in their clinics in coming weeks, thanks in part to a campaign launched by Royal Canin that is being promoted by actor Ian Somerhalder. Take Your Cat to the Vet Day aims to improve the healthcare of cats across the country by encouraging owners to schedule regular veterinary checkups for their feline companions. The initiative, supported by the American Association of Feline Practitioners, the International Cat Association, CATalyst Council, and the Cat Fanciers’ Association, hopes to increase visibility of cats in veterinary clinic by dispelling widespread assumptions about feline health. Research from Royal Canin found 53 percent of owners whose cats have not seen their veterinarian in the past 12 months said they did not take their pet to the clinic because they “did not think it was necessary.” However, annual veterinary checkups are vital for early identification and treatment of illness and disease. Cat owners avoid scheduling veterinary visits for many reasons, reports Royal Canin, whether it is the challenge of physically getting their cat to the clinic or the belief that indoor cats are not at risk for illness or disease. Cats also tend to disguise pain or discomfort, which can allow health-related problems to go undetected by their owners. According to Royal Canin, 21 percent of cat owners only take their pet to the clinic only after it shows signs of illness, which means many might be in an advanced stage of illness when they are examined by their veterinarian. 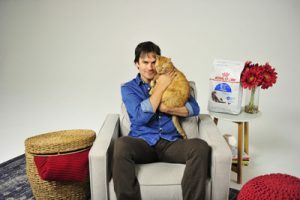 Somerhalder, an owner of two cats, joined the campaign to promote the importance of preventive feline veterinary care. Take Your Cat to the Vet Day takes place on Aug. 22, but Royal Canin advises cat owners to schedule annual veterinary appointments according to their own lifestyle and availability. “Cat owners should identify a time throughout the year that can serve as a regular reminder for this important checkup—such as back to school or when they schedule their own annual medical appointment,” said Dr. Lenox.